ZebraSci Inc, a leading drug delivery and combination product development organization is pleased to announce the expansion of their executive leadership team. ZebaSci welcomes Bob Mehta, an ISO 13485 expert, to the position of Vice President of QA & Compliance. 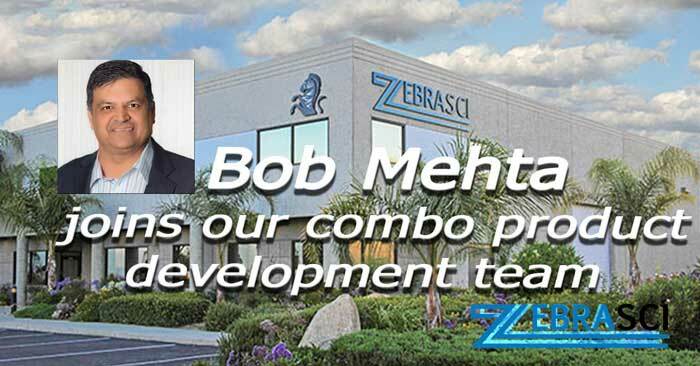 “The addition of Bob Mehta to our leadership team is one more step towards setting the stage for ZebraSci’s evolution as a service provider. We are committed to identifying, attracting and growing the talent we need to become a leading provider of Combination Product Development services.” stated Eric Creveling, Dir. Laboratory Services. Bob brings to ZebraSci critical skills in quality assurance, quality control, supplier management and risk management as well as sales and operation planning. He has more than 28 years of GMP experience with Fortune 500 companies, 13 years of cGMP laboratory experience, and 15 years of managing, supporting cGMP/QSR, ISO 13485 and compliance functions for pharmaceuticals, OTC, biologics, API, and medical device products. Bob holds a Master of Science in Quality Assurance degree from California State University Dominguez Hills, Carson, CA, and a Master of Business Administration degree from Pepperdine University, Malibu, CA. He earned his Bachelor of Science degree in Chemistry from Ahmedabad Science College, Ahmedabad, India. He is an ASQ certified Software Quality Engineer, Quality Engineer, Reliability Engineer, Six Sigma Black Belt, Quality Auditor, Biomedical Auditor, and Pharmaceutical GMP Professional. In addition, he holds a Good Clinical Practices (GCP) Certification from the University of California San Diego and a Lean Pharmaceutical Certification from the University of Michigan College of Engineering. Additionally, Bob serves on the committee of the Industry Board of Advisors for the Medical Device Industry Education Consortium (MDIEC). He teaches medical device regulation, risk management, and project management courses at universities in the Los Angeles/Orange County area in addition to teaching ASQ certification courses. Since 2010, he has been the principal consultant at GMP ISO Expert Services in Southern CA, and provides services to pharma, medical device, biotech, dietary supplement and food manufacturers. Bob is a Fellow of American Society for Quality (ASQ) elected in November 2014. He is the recipient of the 2017 Simon Collier Quality Award given by the ASQ Los Angeles Section. Bob authored the book “Implementing and Auditing ISO/IEC 17025: A Practical Guide” which was published by ASQ Press in April 2013. He has co-authored a book titled “Practical Process Validation” and the book was published by ASQ Press in July 2016. “I am very excited to join the growing team at ZebraSci. The breadth of scientific expertise combined with the investments to the facility and equipment position the company for significant growth potential.” stated Bob Mehta.